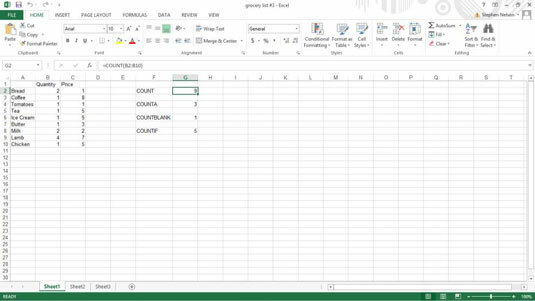 Excel provides four useful statistical functions for counting cells within a worksheet or list: COUNT, COUNTA, COUNTBLANK, and COUNTIF. Excel also provides two useful functions for counting permutations and combinations: PERMUT and COMBIN. into cell G2. The function returns the value 9. You can include several arguments as part of the range argument in the COUNT function. For example, you might also use the syntax =COUNT(B2,B3:B5,B6:B7,B8,B9), which would return the same result as the formula you see here. into cell G4. The function returns the value 3.
into cell G6. The function returns the value 1.
where range is the worksheet range in which you count cells and criteria is a Boolean expression, enclosed in quotation marks, that describes your criteria. This formula appears in cell G8 of the worksheet. You can use other Boolean operators to construct other match criteria: Use the < operator for a less-than comparison, the <= operator for a less-than-or-equal-to comparison, the >= operator for a greater-than-or-equal-to comparison, the = operator for the equal-to comparison, and the <> operator for a not-equal-to comparison. The function returns the value 120, indicating that 120 different ways exist in which three items can be selected from a set of six. This function returns the value 20. The COMBIN function isn’t technically an Excel statistical function, by the way, but is closely related.